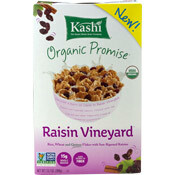 This cereal from Kashi's Organic Promise line is made of up hearty flakes (comprised of rice, wheat and quinoa) and sun-ripened raisins. It has tons of raisins - more than I've seen in any other cereal. I advise that you shake the box and stir the cereal in your bowl or it's possible to get more raisins in a spoonful than flakes. The cereal is USDA certified organic and the flakes contain this year's popular grain of the moment... quinoa. The ingredient list is wholesome, short and easy to read. The flakes lose their crunch quickly in milk and they are a bit gritty. The overall flavor of this cereal is somewhat boring. 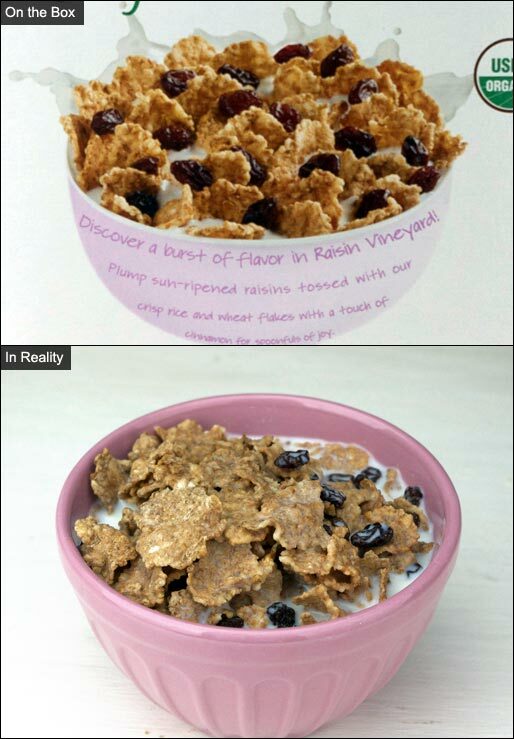 Raisin Bran cereals from Post and Kellogg's have better flavor. The nutritional profile of this cereal isn't very impressive despite the claims on the box. The cereal does provide 15 grams of whole grains per serving, but that equates to only 2 grams of beneficial dietary fiber per serving. Each serving has 12 grams of sugar per serving. That's more than Post's Poppin' Pebbles or General Mill's Chocolate Toast Crunch - both of which were introduced about the same time as Raisin Vineyard. 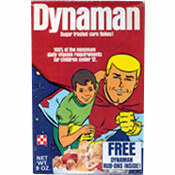 My advice is to skip this cereal and stick with classic Kellogg's Raisin Bran. It has more sugar, but it also has a lot more flavor and over 3 times the dietary fiber of this new cereal. I like that Raisin Vineyard is organic, but that's about all I liked. Nutritional Considerations: Each 3/4 cup serving of Raisin Vineyard has 170 calories, 0 grams fat, 0mg cholesterol, 140mg sodium, 40 grams total carbs, 2 grams dietary fiber, 12 grams sugar and 4 grams protein. What do you think of Raisin Vineyard? I bought this for a $1 a box at Grocery Outlet. With grapes or peaches or blueberries, the dryness of the raisins is improved. I found myself eating more of this cereal than is good for me. If a Kashi product winds up at Grocery Outlet, then I assume it was a new experiment that didn't fly. The raisins were hard and difficult to chew. Flavor just okay. Love the new Raisin Vineyard. Delicious! The product is really over-priced though - WHY? Each box is over $4.00! Flakes very tasted, good amount of raisins. In all, a wonderful addition to other KASHI products. It's a substitute for Crispy Wheats 'N Raisins. It stays crunchy for a long time in milk. The raisins were soft and sweet. I like it better than Raisin Bran. I think it keeps me full longer too. At first I was really excited for this cereal. The flakes were super crunch at first - but then they almost got touch and chewy in the milk. There ARE lots of raisins - I'll agree with Mr Breakfast there - but they're also VERY tough and dry. I much prefer the Raisin Bran raisins, because they're much more most and delicious. I was surprised to read that there was a lot of sugar in this cereal because I thought it could have used more sweetness. But that might be because it just lacks flavor overall. I think this cereal is guilty of overselling itself with hip buzz-words like "quinoa" and "organic" - and got my attention with "vineyard" - but didn't deliver on the promise of a "burst of flavor" or "touch of cinnamon." Overall - just BORING. There are definitely better options out there for raisin flakes!